Image caption The Institute of Fiscal Studies has attracted the ire of Nick Clegg. Deputy Prime Minister Nick Clegg has locked horns with the Institute of Fiscal Studies, deriding its analysis of the Spending Review. 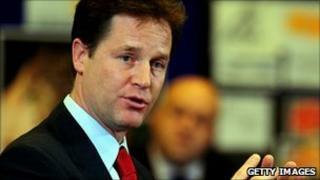 "We just fundamentally disagree with the IFS," Mr Clegg said. But the IFS, often described as a "highly respected" or "leading" think tank, is not easily dismissed. Its former head has just been appointed to head the Office for Budget Responsibility and Chancellor George Osborne has, in the past, described it as one of the most "credible independent voices on the public finances, taxation and public spending". But why do think tanks wield so much influence and what exactly do they do? There is no formal regulation of think tanks. Anyone can set one up. According to US academic Dr James McCann, who compiles an annual think tank ranking, there are 6,305 such bodies in the world. He lists 285 in the UK, giving it the most after the US and China. Some, like the IFS, have garnered worldwide reputations, but others are small and obscure. "They are funny institutions that are hard to categorise. Some are quite academic and some function more like journalism. But they do turn up research that impacts national debate," says Ben Rogers, associate fellow of the Institute for Public Policy Research and Demos. "They often make serious research newsworthy so it is picked up by politicians," says Mr Rogers, who is also a judge on Prospect magazine's think tank awards. According to the Oxford English Dictionary, a think tank is a research institute or other organization providing advice and ideas on national or commercial problems; an interdisciplinary group of specialist consultants. The term first appeared in its current usage in 1958. Before that, the phrase was a US colloquialism for the brain. But the idea of a independent body that seeks to influence public discourse goes back a long way. Chatham House, also known as the Royal Institute of International Affairs, traces its roots back to 1920. The organisation has given its name to the famous Chatham House Rule, which is used around the world to ensure free and open debate. In the UK, think tanks have proliferated in the past 20 years and usually have political leanings. The Centre for Social Justice was set up by Iain Duncan-Smith, who is now Work and Pensions Secretary. The Adam Smith Institute was a favourite of Margaret Thatcher. Many think tank staffers often end up working in government. In 2008, one small think tank - the Progressive Policies Forum (PPF) - came under scrutiny after allegations that it channelled funds of over £50,000 to support Peter Hain's election campaign for the Labour Party deputy leadership. But most like to regard themselves as staunchly independent. The Institute for Fiscal Studies falls into this camp. Although it allows public and private bodies to fund particular pieces of research, it does so only if it is "free to publish our findings whether the funder likes them or not". It says its "most cherished asset is a hard-won reputation for objectivity and impartiality" and that reputation "rests on the quality of our work". "We are a charity. We aren't part of a large university. We don't do consultancy work. We don't have politically motivated sugar daddies. And we aren't bankrolled by a few big companies." Mr Rogers doesn't believe Mr Clegg's criticism will have a lasting impact on the IFS's stature. "There's no other think tank that has such cross-political authority. It's viewed as being very nonpolitical and non partisan." For its part, the IFS has not responded to Mr Clegg's criticisms but his blistering attack on the IFS's analysis does not seem to have found support in other quarters. As such, it is only likely to raise the profile of the IFS and the role think tanks play in British political life.